If anyone asks me for a list of "must see" places in the Phuket region, Phang Nga Bay is top of the list. The bay is actually very big covering all the sea and many islands in between Phuket, Phang Nga and Krabi and I have seen only small parts of it. One of these days I want to buy a boat and go exploring! 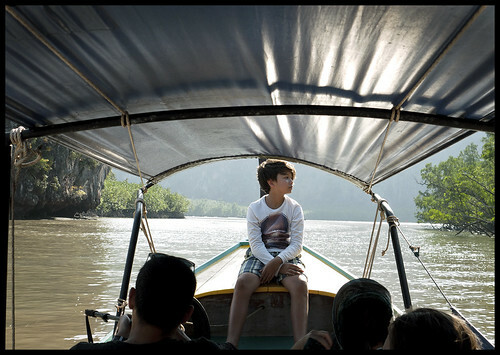 We have done several trips in Phang Nga Bay with friends and family. Our last one was back in .. wow, I had to double check. It was back in September 2010, I did not realise it was so long ago! I had planned that trip as an afternoon excursion, renting a longtail boat and aiming to reach James Bond Island late in the afternoon when all the tours had gone home and hopefully with the bonus of some golden afternoon light - it half worked. We were the only visitors on this otherwise crowded tourist attraction, but on that day the light was poor, with dark clouds and some light drizzle. So I said "we have to try that again!" 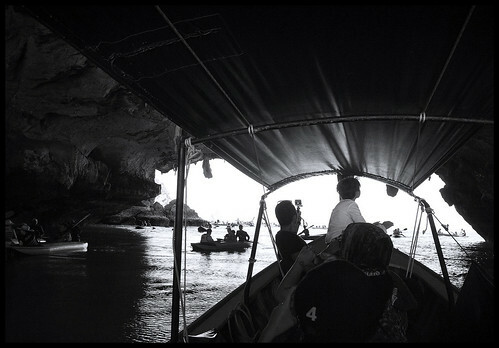 and time has ticked by, and life has moved on, and it's been more than 4 years since our last Phang Nga Bay trip. Well, earlier this month my cousin and his family who live in Singapore came to Phuket for a few days, I had a day off on Saturday February 7th 2015 and the weather looked good, so we decided that Phang Nga Bay had to be visited again. And everyone had a great day out. From our house it takes just over an hour to drive to Phang Nga Town. We live just outside Phuket Town. If you were driving from the north of Phuket island, it would be a shorter drive, if you started at Kata beach for example, it would probably take at least 90 minutes, maybe 2 hours - remember it can take well over an hour to get from one end of Phuket to the other! We do this trip without signing up for a tour, we drive ourselves, we negotiate a boat, we find a place for lunch ... doing it yourself in a foreign land is not for everyone, but it's not exactly brain surgery. There are lots of tours doing this area, but many are cheap, rushed and crowded. My friends at Easy Day Thailand can do a tour which is based on the way we do Phang Nga Bay - more personal and trying to avoid the crowds by avoiding the peak times (see tour options here). 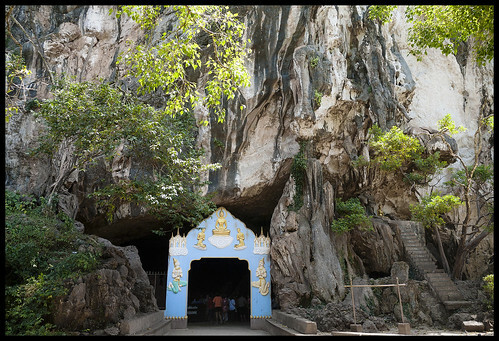 We headed up to Phang Nga in 2 cars as there were 9 of us altogether - my wife and I, our 2 kids, my daughter's friend, my wife's cousin's son, my cousin and his wife and their son! We set off late morning, no particular rush and stopped off first at Wat Suwan Kuha temple which is just before Phang Nga Town. Glad to see the entry fee is still 20 Baht (and no dual pricing). 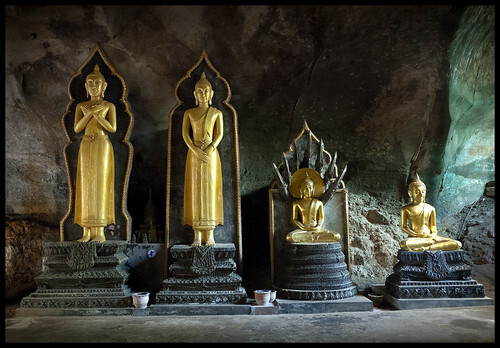 Wat Suwan Kuha features lots of monkeys outside and a big reclining Buddha inside along with many other Buddha images and behind the Buddha cave is a larger cave. After the stop it was time for lunch. Now, back in 2010 we ate at a place called Samchong Seafood, which is on a mangrove river which leads out into the bay and we rented a boat from the jetty next to the restaurant. In the last few years I have heard from several independent sources that this restaurant has gone downhill. Our friends at Easy Day Thailand don't use it now .. and although I will reserve judgement until we go check it again, on this trip we played it safe and went for lunch at Dairy Hut Seafood which is just past Phang Nga Town. We've eaten here a number of times, and it's always been good, as it was this time too! Then we backtracked a few km - just before Phang Nga Town if coming from Phuket there is a right turn and a sight saying "Phang Nga National Park" which leads down to the Phang Nga municipal jetty. Arriving at the jetty, longtail boat drivers leap into the road to flag down cars. We negotiated a boat for 1600 Baht, actually a little more than I was expecting and my wife and I both thought the drivers were a bit of an unfriendly bunch, reinforcing our idea to give Samchong a try again some day, as the longtail driver we had there was really nice. However - 9 people, 1600 Baht .. yeh, let's not worry too much at that price! 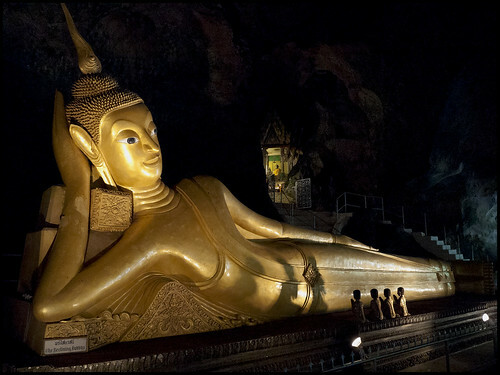 I am not sure a "tourist" could get exactly the same deal and even if you maybe pay a little more, I'd suggest doing a trip with Easy Day Thailand, with a guide along with you to explain things. (above) Our longtail boys for this trip were a right couple of charmers. We know you can also get a "local" boat from here to Panyee village, and we'd like to try that sometime. We arranged with the boat boys to take our group to Panyee village first and then James Bond Island (real name Koh Khao Ping Gan). The jetty is up a mangrove river about 7km north of Panyee, about 20 minutes by longtail boat. 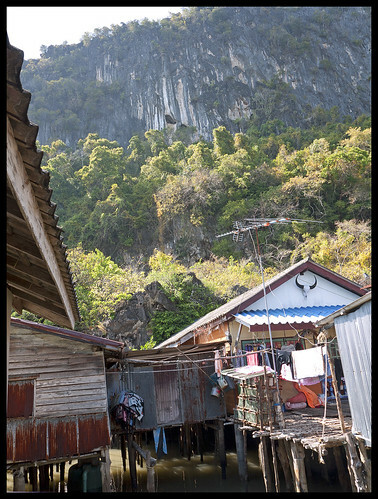 Panyee is a stilted village built around a large limestone karst. I find this place very interesting, once beyond the row of restaurants and souvenir stalls. It's what I think of as a micro-society, a place slightly removed from reality, a little isolated from the rest of the world although these days there are hundreds of tourists visiting every day. Thus even more reason to find some backstreets. 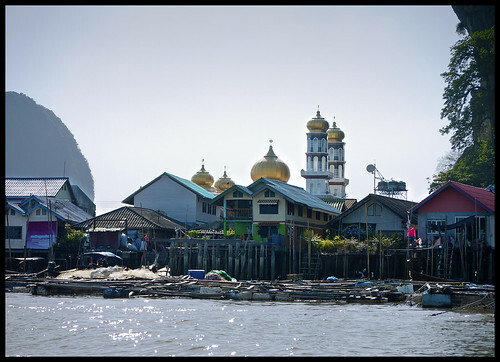 (above) Koh Panyee from the water - the mosque is just about the only building built on solid land. Everything else is on stilts. Everything is built around the rocky island called Koh Panyee which towers above the village. Since our last visit there have been a couple of changes ... the mosque has been rebuilt with shiny golden minarets, and the island has a floating football pitch! We walked through narrow streets passing the mosque to the west side of the island. 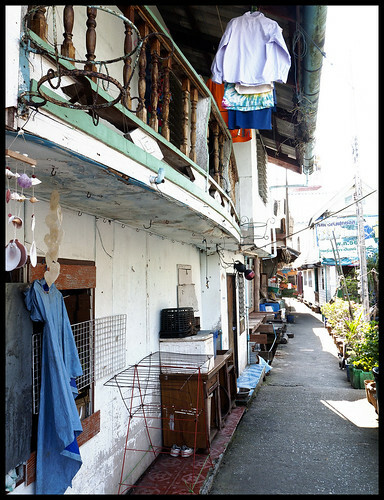 (above) The back streets of Panyee village are narrow and (to me) full of interest. At every step I wonder what it's like to live here. I imagine it's a very close community where everyone knows everyone and doors are always open. Life will have changed a lot over the last 20 year with tourism generating a lot of income, but it's still a fishing village at heart. The mosque when we last visited looked rather sad. Now looking much healthier. 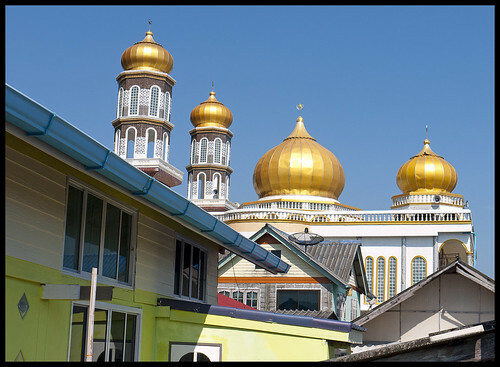 Panyee is Muslim like much of the Phang Nga coastal area (and also much of Krabi and a fair amount of Phuket!). Although the stallholders selling souvenirs look a little bored, I see a lot of smiles here, I think it's an easy lifestyle. 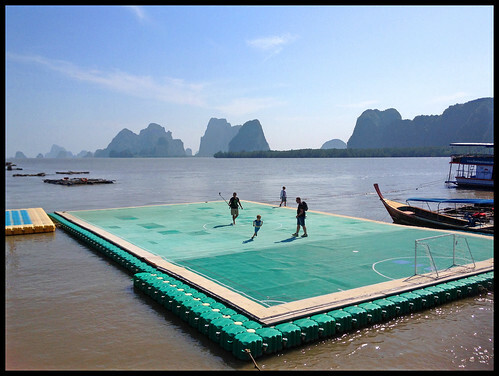 Crossing over from where we landed, past the mosque I found what I wanted to see - the floating football pitch. It wasn't there when we visited in 2010 although there was a concrete recreation area attached to the school. 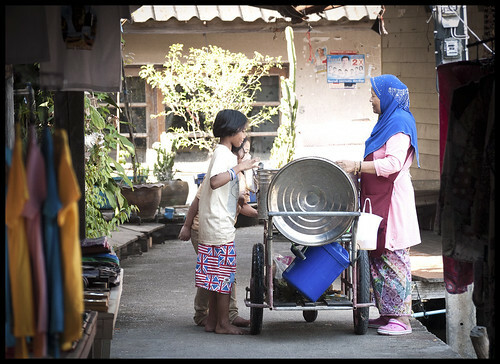 The story of the Panyee football team is now well known thanks to a video made by a Thai bank. 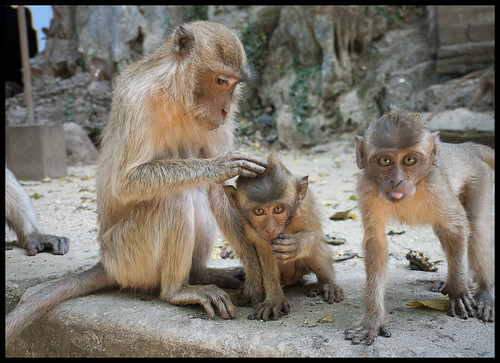 You can find the video and more photos on a blog page I wrote in 2010 about Koh Panyee. And what a spectacular place to kick a ball around! We all enjoyed a run around. The kids realised that you'd get quite wet playing here, as you'd need to jump into the sea to retrieve the ball any time it went out of play! We spent about an hour at Koh Panyee and I think I would happily spend half a day there taking photos. 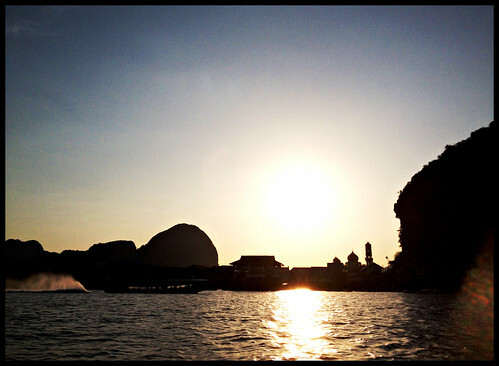 It was nearly 4pm when we started heading towards James Bond Island, which is about another 7km south. We went via a small island where several sea kayak companies have their bases and on a busy high season day you can find hundreds of tourists on a little kayak tour (part of a day trip package) - not for serious kayakers! Our longtail picked a path through the kayaks and through a small cave. All of these little islands are beautiful. I want a boat! 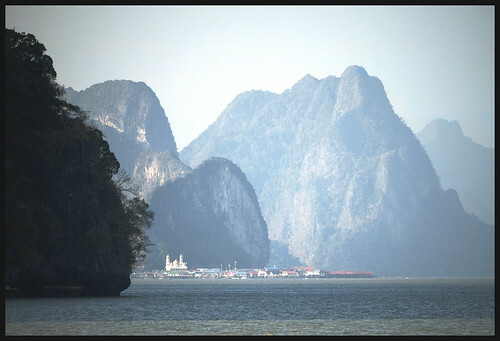 We got to Koh Khao Phing Gan (the proper name for James Bond Island) about 4:30pm. Rather shocked to find we were a bit early .. still a couple of groups of Chinese here! 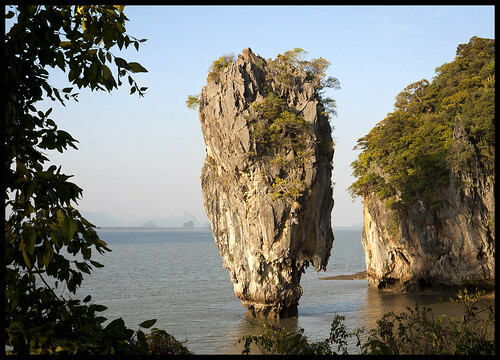 The tall rock that sticks up from the water is called Koh Tapu, which means "Nail Island". I wonder how many years until it falls over? I'm sure the base looked fatter in the movie! In the late afternoon light, this area is gorgeous. The photo above was taken at nearly 5:30pm, by which time we had this "crowded" tourist attraction to ourselves. Even the souvenir stall holders had gone. I had not noticed before, maybe it was the light, but you can see Koh Panyee from here, 7km to the north - what a view! (above) Panyee village as seen from James Bond Island. Touristy or not, it's pretty frikkin' spectacular! And if it can be called "touristy" then it's only for a few hours per day. We must do this again sometime soon, and not wait another 4 years! We stayed as long as we could on Scaramanga's island, but for sure the boat boys were worried they'd be getting back late. I was snapping photos up until we left just after 5:30pm. Now I only wish I had a better camera ... Well, it's my birthday soon :) These pictures were taken with a Panasonic Lumix G1, not the most modern camera. Actually a couple of these photos were taken with an iPhone. I am really considering splashing out this year on a Canon 7D or something of a similar quality. Anyone got a spare? Anyway .. we sped back to the Phang Nga pier in about 25 minutes from James Bond Island, passing Koh Panyee with the sun sinking low. Every time we've done this trip it's been a great day out. We drove back to Phuket, straight into Phuket Town for dinner at Kopitiam at about 8pm. Perfect day! (above) Not far off sunset as we dash past Koh Panyee on the way home.